I love photos. I love art. Yes, that is why I like to display our family photos in the house and I've also set up a mini art gallery for the paintings done by the kids too. That said, I've never imagined that photos and art can be combined in a special way to form a personalised, one-of-a-kind creation that is absolutely breathtaking. 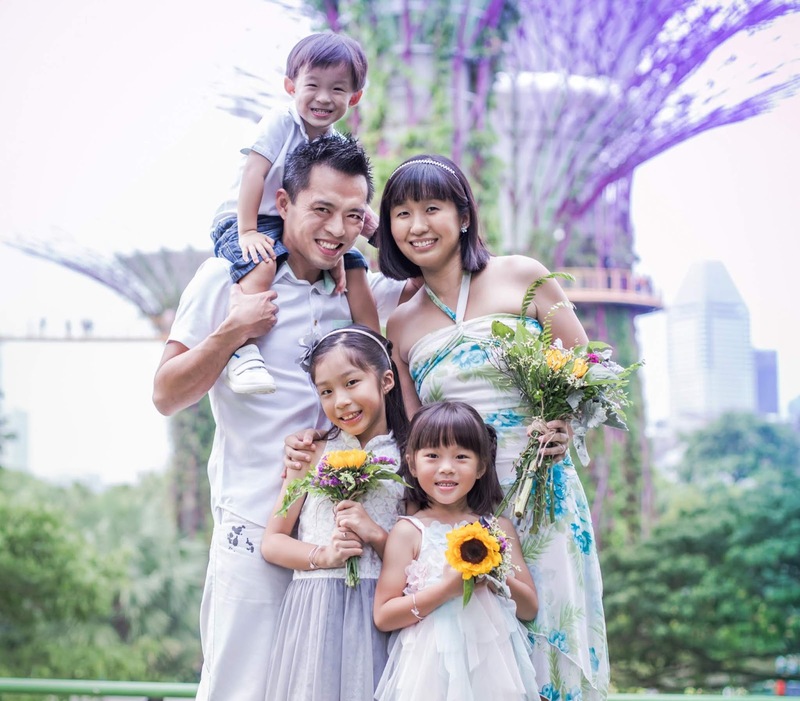 In today's Creativity 521 post, I'm sharing with you about Lithofy.me, a Singaporean start-up that has quite a unique selling point - it helps to transform your memorable photo into a captivating piece of art. Sounds incredible? Let me show you just how beautiful and creative their products can be. I also have a giveaway and discount code for my readers at the end of the post, so read on for more details. 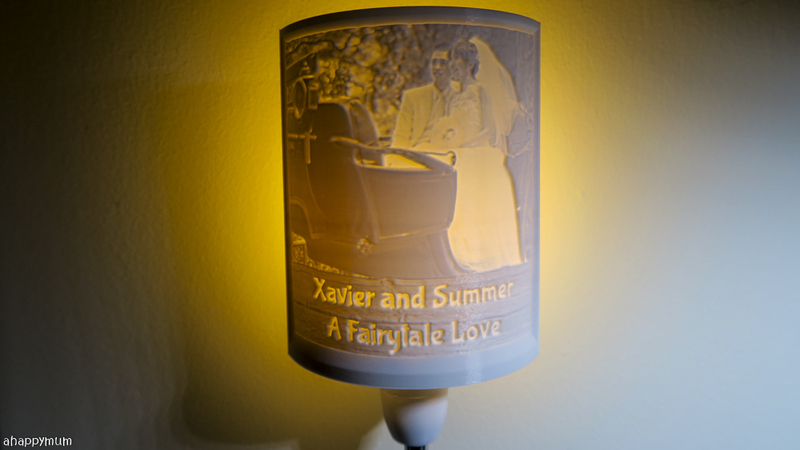 Have you heard of lithophane? It is is an etched artwork in a thin piece of translucent porcelain that can only be seen clearly when backlit. 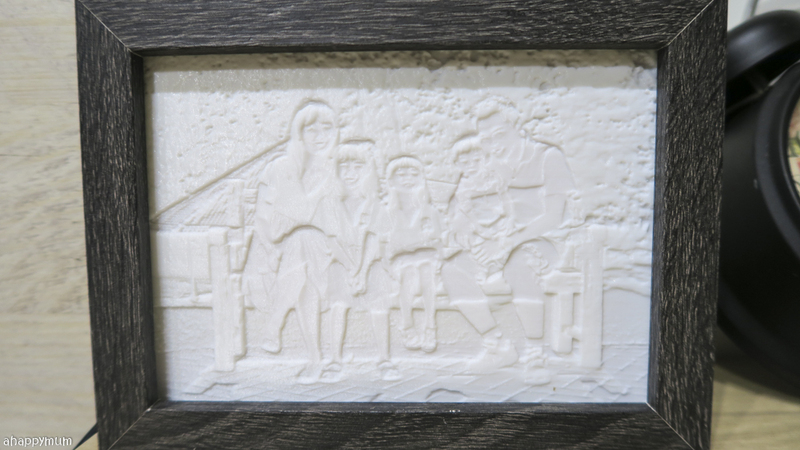 At Lithofy.me, they transform your photo onto a white relief sculpture and it becomes a piece of artwork that not only radiates light, but also the warmth of your precious memories. 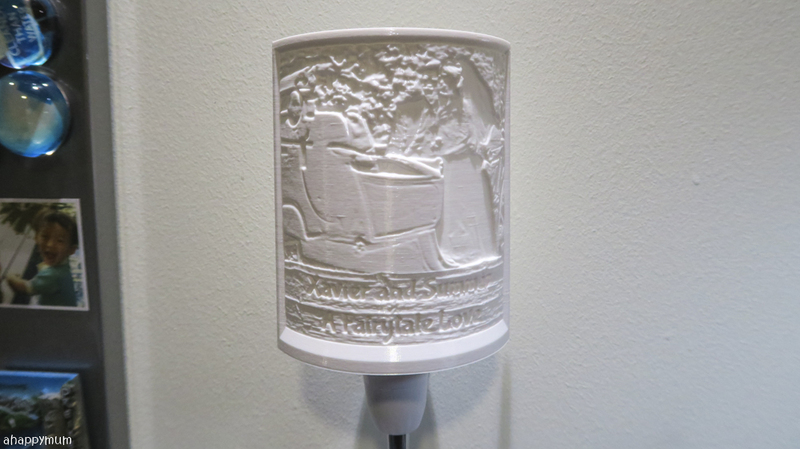 I did a search online and realised that lithophane printing is not that uncommon after all but since I have not heard of it in Singapore yet, this was something very intriguing and innovative to me. From what I'm told, each piece of art takes 12-18 hours to be carved and every made-to-order piece turns out to be truly unique. 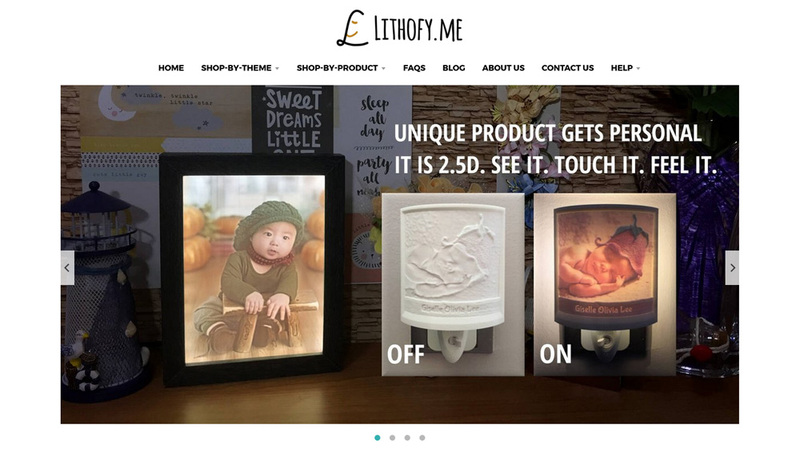 Lithofy.me offers four different types of products, namely personalised night lights, flexible lights, photo with backlit frame and artworks. The selection in the artworks category is quite limited for now and since I definitely think that a customised piece is so much more special, I'll be sharing more about how we personalised our own night lights, flexible light and a photo with a backlit frame which now sits proudly in our Scandinavian living room. For every piece of art, you can customise the picture and choose the words according to the templates across different themes. If you can't find a template that you like, you can also use your own photo and choose your own favorite words, be it your name and your loved one, special dates, favorite quote, personal message and so on. Also, you can decide if you prefer the light to be in MONOCHROME or COLOUR. 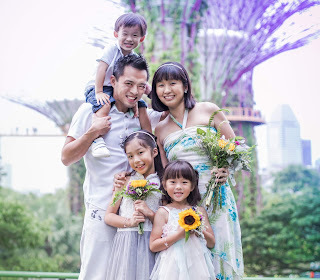 I think both of them are attractive in their own ways and while I chose to go with vibrant, coloured ones for those pictures with the kids, I also did a classic, monochromed one just for the hubby and myself. Check out how ours turned out below. The flexible light features a flexible neck which allows you to easily adjust the light to the ideal position. Using LED light bulbs which are said to be able to last for around 20,000 to 50,000 hours, you can use it as a night light or a desk decoration. 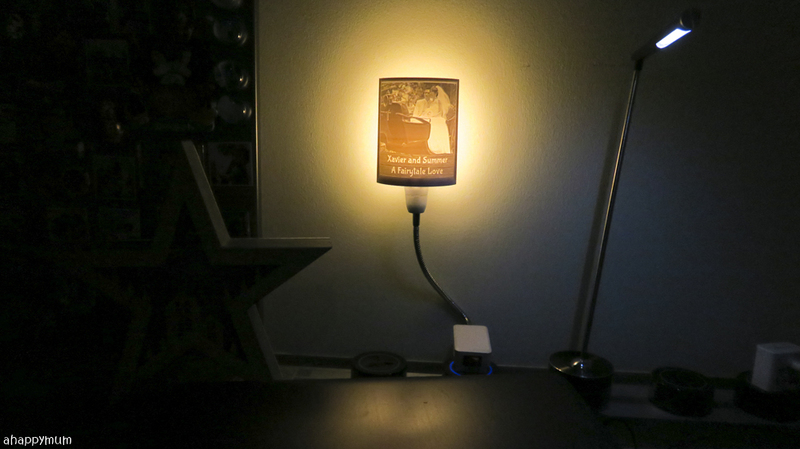 I decided to place our night light at my work station in the master bedroom (yes, so that I can look at our lovely wedding picture every time I need some inspiration). This was the best place in my view and the only slight issue was that because our Eubiq track is placed quite near to the wall, the plug of the flexible light could barely fit in and the neck ended up being 'pushed' towards the wall. 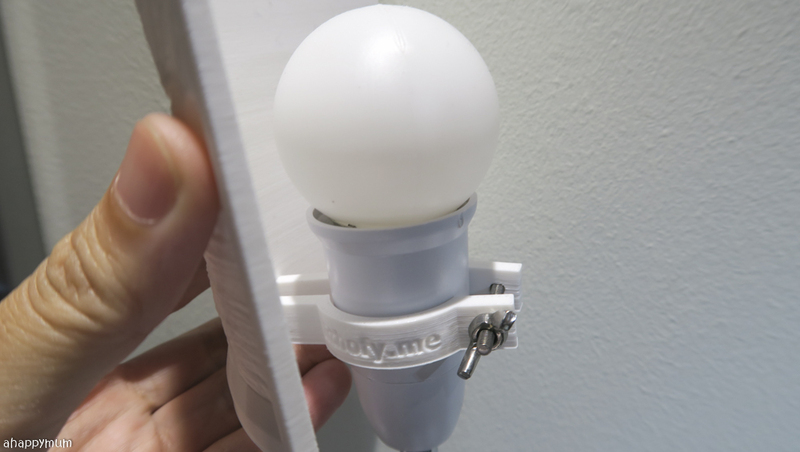 So, I would suggest for the night light to be placed somewhere where the space is not so tight for the plug so that it is easier to adjust the neck and shift the light around. This is the light that I chose to be in monochrome and I think it adds a vintage feel to our wedding picture which was, erm, taken nearly a decade ago. I personalised the light with our names and also the theme of our wedding to make it extra special for us and to remind us that we are so blessed to have found our happily ever after. See how it lights up! I was looking for a nice photo to display on our TV console and so this couldn't have come at a better time. Sure, I have to admit that the lithophane doesn't produce 'high res' artwork and the photo can come across as a little grainy when lit. But you have to remember that this is a carved, 2.5D piece of art so to have achieved this end result, I think it's more than what we could have asked for. See the "white relief sculpture"? You know what's the part I love most about the lithophane? It's that at first glance, it seems to be nothing much and you might just brush it off as a piece of colourless art display. Once you turn on the switch, which I hid behind the frame, and the light comes on, TA-DAH! Yup, you can see the contrast in just a split second. That is the also the part where you draw a few "Wow"s and impress the kids, the guests and anyone who sees it for the first time ever. I must say this really makes a difference to my living room and I love that we have such a special family photo-art piece to display now. My kids can't live without night lights, how about yours? Yes, night lights have become an essential part of our lives and over the years, I've tried out pretty ones, functional ones, short lasting ones but never have we been able to use customised ones. 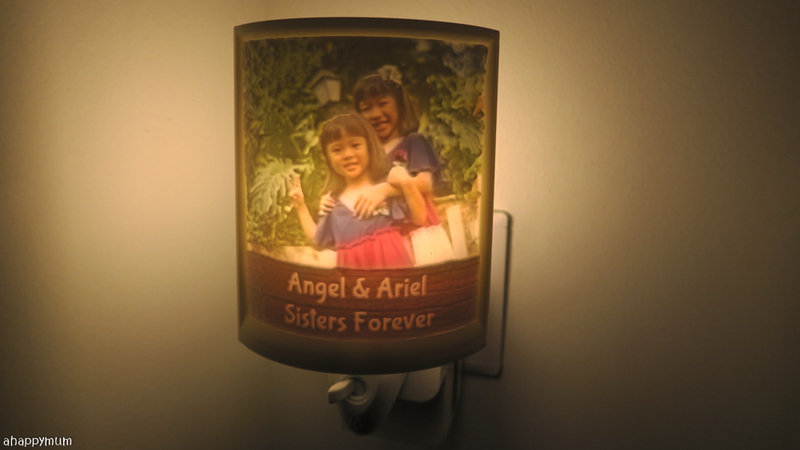 Since the girls bunk together in their Pink room, it was natural that we customised a night light using a photo of the two sisters. See how the night light sits quietly and unassumingly in a corner of their room? In fact, it almost blends into the background, doesn't it? When the light comes on, that's when the magic comes alive. I can't tell you how fascinated the girls were when they first saw it! Till now, they still love the night light so much and love seeing their own photo light up their room. I chose a simple but meaningful wording to remind them every time they go to bed that they are best friends and sisters forever, and that they need to love, care for and protect each other. So, the boy is another one who doesn't like the room to be pitch dark so we always need to turn on a night light for him. He may be co-sleeping with me right now but this lucky one will get his own Blue room next time so we customised a night light just for him. Every time we need to turn it on, he excitedly runs towards it, flicks the switch and says "Me! Ball!" in the cutest possible way. By the way, the switch is located below and can be easily flicked from side to side to turn it on and off. 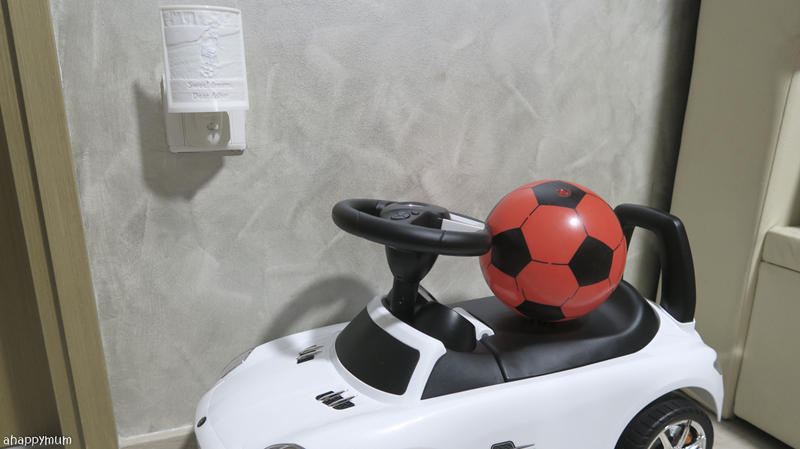 It can be a good or bad thing, depending on how itchy your little ones' fingers are, so just remind them not to keep playing around with the switches. Anyway, it's evident that the boy loves his night light and for me, I like the fact that I get to see all my babies' names and their faces even when it gets dark. While we are totally thrilled with how our photos were transformed into lithophanes and I have no complaints about the quality of the artwork, we did encounter a couple of glitches initially. Firstly, one of the night lights fused on the first night that we started using it and burnt marks could be seen. 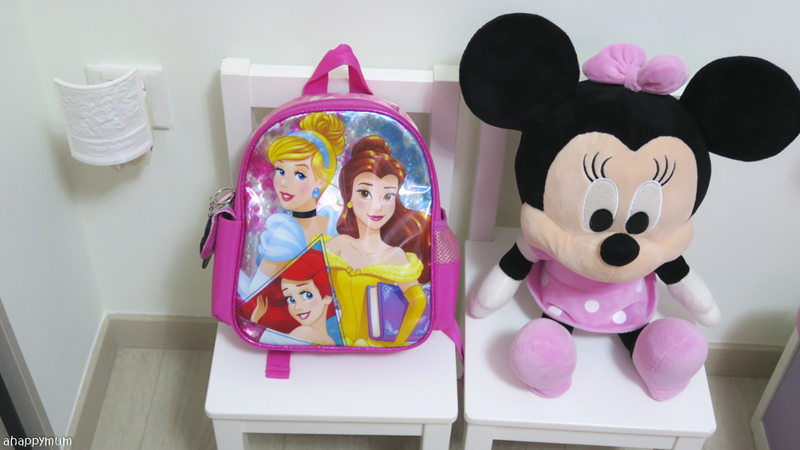 It came as a shock for us because this was placed in the girls' room so we were worried if it would become a safety hazard for the kids. We told Lithofy.me what happened and they were just as surprised because they assured us that their bulbs go through stringent safety tests and this had never occurred before. While we hoped that this was a one-off incident, what amazed us was how Lithofy.me was quick to respond and efficient in replacing the spoilt bulbs. Not only that, they also replaced the glass bulbs with plastic ones for all their night lights after hearing our concerns on safety issues. Fyi you can buy those normal bulbs from stores to replace them when they die out. Secondly, one of the back supports for our flexible light broke off and I had to glue it back. I take it as partly my fault because like I mentioned earlier, our night light was pressing against the wall so it likely created pressure and caused the lithophane to drop off, breaking one of its back support in the process. 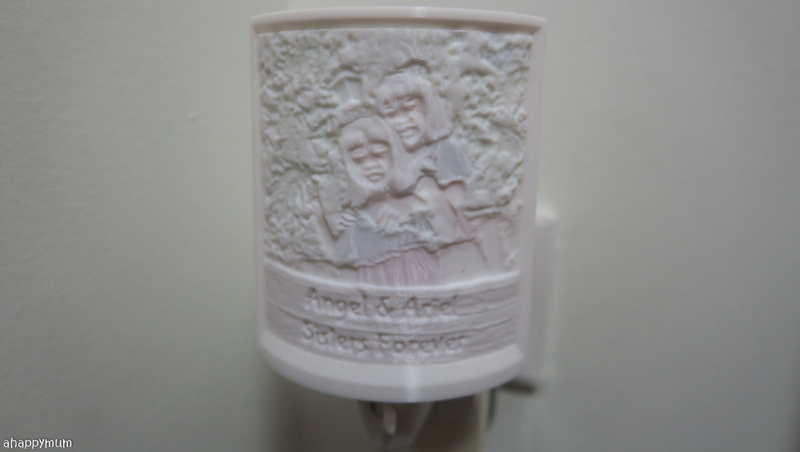 As you can see below, the lithophane is only held around the bulb by means of the two supports and a screw. 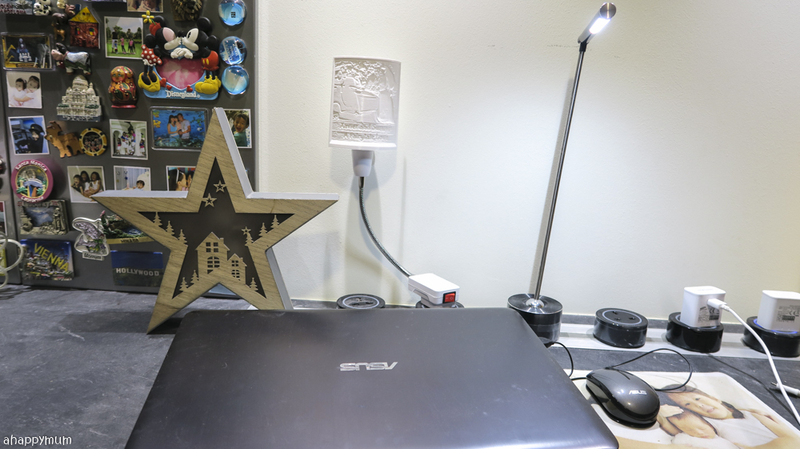 Unlike the night light, this one does not have a base for the supports to rest on (see the night light close-up shot above) so if you add pressure on it, the lithophane can drop off. 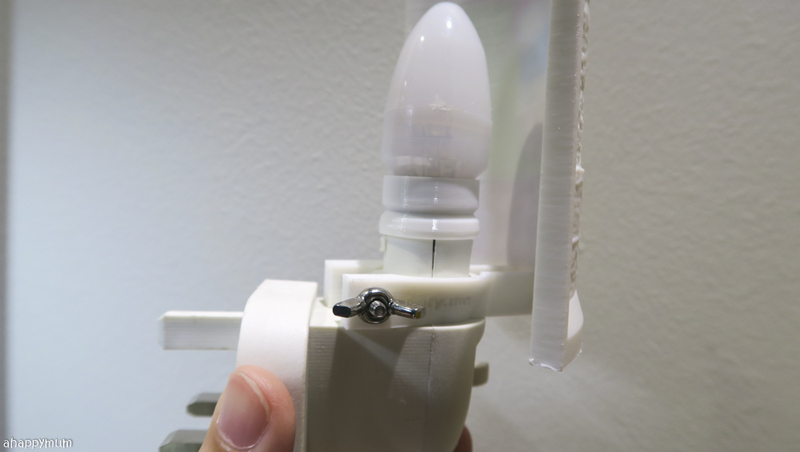 Again, I've reflected this to Lithofy.me and they have assured me that the supports will be made thicker for all future products so that they can wrap around the bulb more securely and will be less likely to break. As a fairly new business, I have to give them credit for valuing their customer feedback and taking measures to address any existing issues. They respond to queries promptly, deliver their products on time and provide great customer service, so I believe they will keep improving themselves and their products in the long run. For us, we are just happy to be one of the first to try out this creative product and witness how photos can be transformed into art pieces. More than that, we are sharing the joy with all our readers too! From now to 31 December, you can enjoy a 20% discount across all products on Lithofy.me by using the discount code AHM20 when you check out. 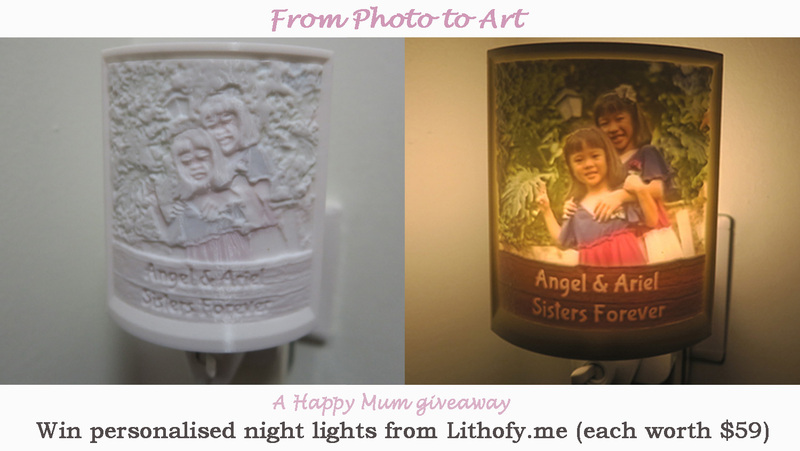 I am giving away TWO personalised night lights (each worth $59) to two lucky readers. You can choose if you prefer it to be in monochrome or colour and personalise it with your own photo too! This will make such a wonderful customised night light for your child or a thoughtful festive gift for your family/friend too! To participate, leave a comment in this blog post with your name, email address and tell me your favourite Lithofy.me product. To increase your chances of winning, you can choose to carry out the rest of the options. Best of luck! For more information on Lithofy.me, visit their website or connect with them on Facebook, Twitter, Pinterest and Instagram. Disclosure: This is a sponsored review and we received the above products from Lithofy.me in exchange for writing this post. All photos and opinions are my own. I love the personalized 2.5D night light! Love all their products but the personalised night lights would be my favourite as my children have been bugging me to get night lights for them and it would be good way to start letting them sleep in their own rooms. I like the photo with backlit frame. I like the PERSONALISED FLEXIBLE LIGHT. So I can place it in different places for different occasions! Thanks for sharing this amazing art. This is my first time hearing it and love this personalised idea. 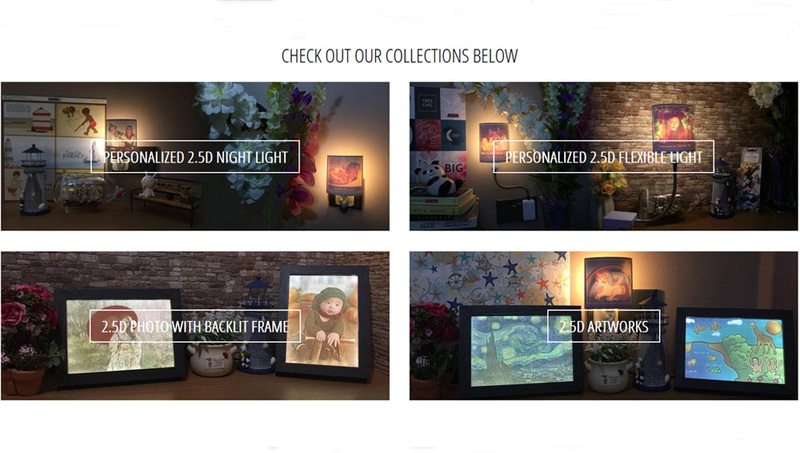 My favourite is the personalised 2.5D night light and it will definitely amaze the kids. I would like the colour version if I am one of the lucky winner. Finger crossed. Thanks again for your sharing! I cant decide between the photoframe and nightlight! Love both! Thanks for the giveaway! I'm already thinking of who to gift these lights for Xmas! 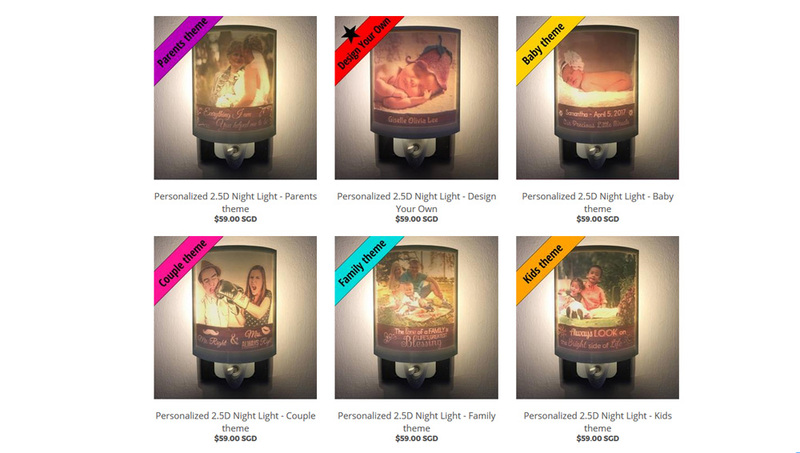 I love all Lithofy.me products especially the personalized night light. Without a family portrait hanging up on the wall, I feel like my home is not completed. 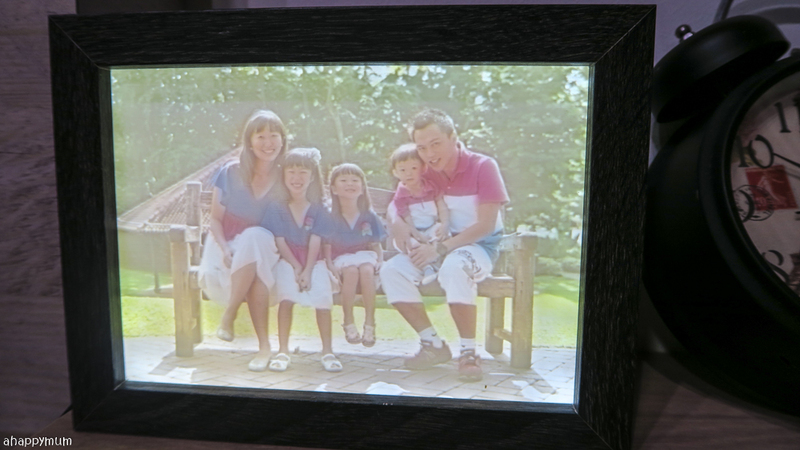 So our house is full of frames that consist of my sweet family bonding time memories. I want to win the giveaway so that during my sleepless night I can see my kids' happy faces instead of facing the dark night alone. Thanks for sharing! 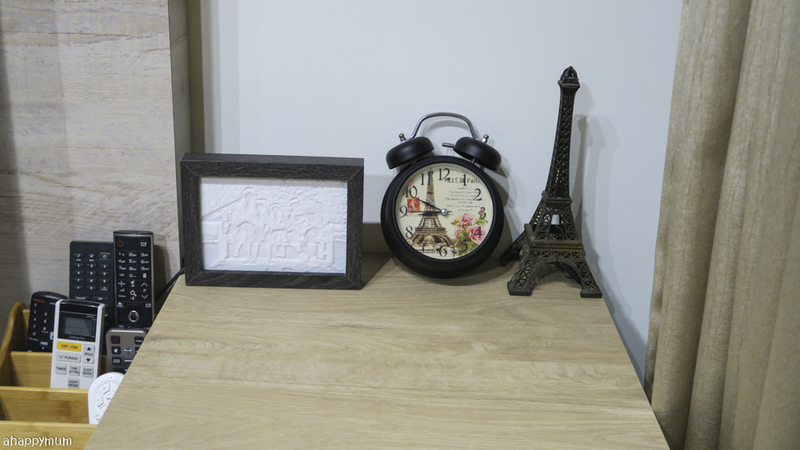 I love how the products fit perfectly in your room layout. I would like to get the photo with backlit frame for my living room. Thanks! My favourite is the Personalised Flexible Light, hope to be the lucky one! My fav is the personalised night light. My favourite is night light too. Most kids need it isn't it.. I can imagine their face lit up with this amazing light like an art piece wonder. Thanks for sharing, all the options are amazing! I would love to have them all! 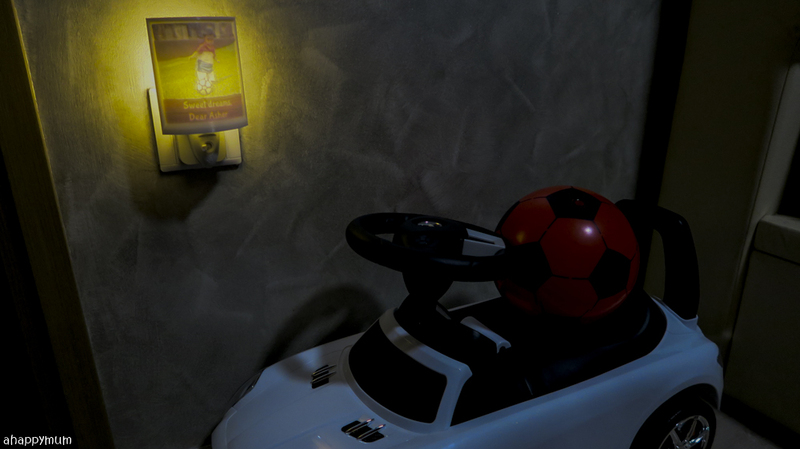 My favourite is the night light as my kids can't do without one! i love the personalized night lights. Its so special and beautiful! The night lights are lovely! 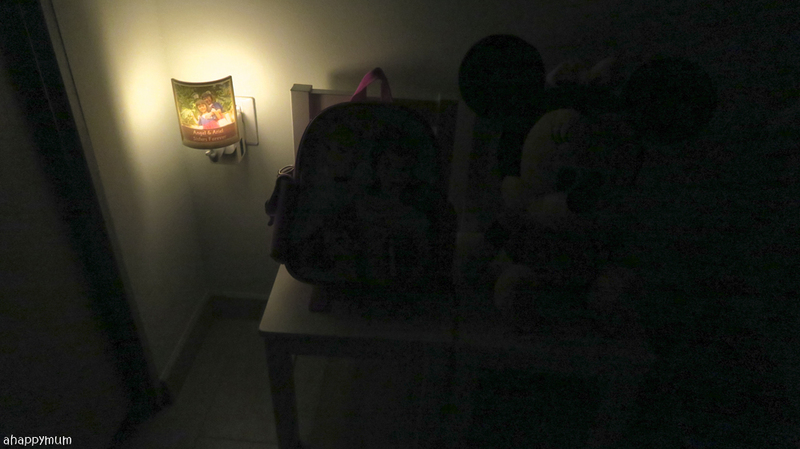 Personalised night lights are definitely my favourite and the life saviour for my girls who are afraid of the dark. As with many parents, my hubby and I are called upon to sleep together with the girls in their room as they are afraid of the dark or thunder/lighting during rainy nights. With this personalised night light, I’m sure our duty can be relieved as they can be assured of someone’s invisible presence in their room with them. No more "你怕黑吗?" 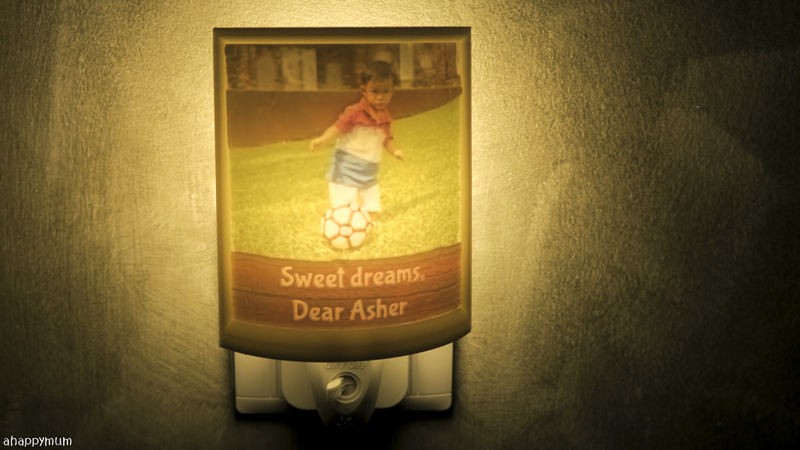 with this awesome personalised night light. 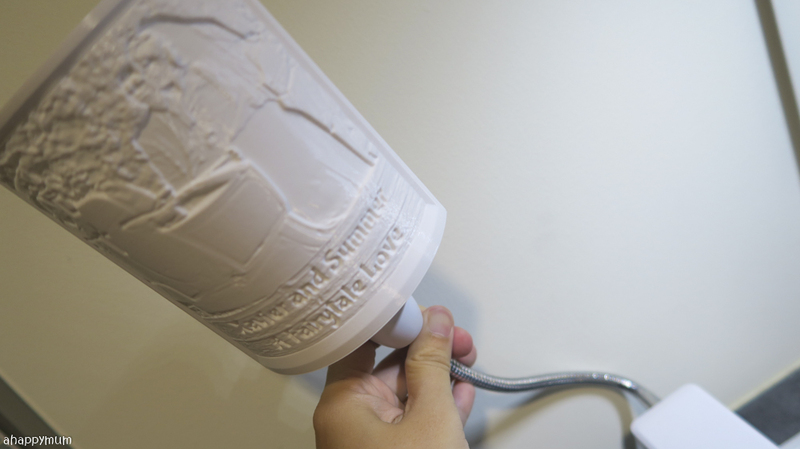 Not only will it lightens the room, it also brightens the smile on my boys. Hope to win this. It so unique a light between us ... It brighten up the room fill with love..